Summer is always a chancy time for tabletop games releases, some years seeing plenty of games trying to beat competitors to a traditional Gen Con release, others where every publisher holds back and releases only at the big July-August convention itself. Either way, the yearly Origins convention in Columbus, Ohio usually offers up a preview of what's coming to print, and this year we were there to get in a few plays of the lineup and tell you what we thought was best. Where available, we've included links to the game if it's out or a crowdfunding campaign if it's running. Now get to planning your future gaming! 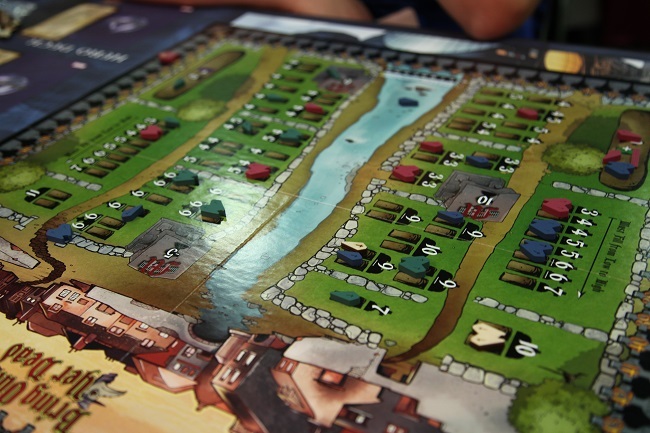 A game of comically inept gravedigging from first-time designer Aaron Watts, Bring Out Yer Dead is a game where down on their luck nobles scrabble to have their families buried in the places of highest honor in the cemetery. 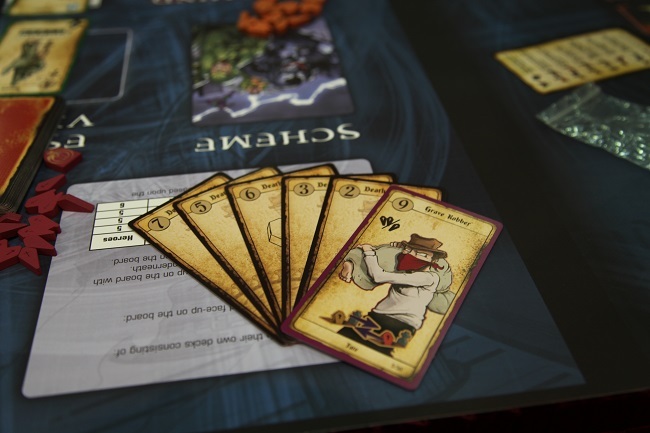 Each turn, players' scripted actions take place in a careful order that might see some players' family members buried and others tossed in the river. See, in a given round, the digger will only bury so many coffins, which is randomly determined by a drawn card. Actions are based on a hand of cards, each with a number determining when it does its power in the round - like put a coffin into the queue to be buried. Additionally, players can gain fortune and treasure cards for bonus effects or extra points based on where they've buried their relatives. It's a nice mix of euro-style gameplay, gallows humor, and pushing your luck that scratches a lot of itches at once. You can learn more at Upper Deck Entertainment's official site.